We aim to make students aware of the importance of healthy eating and adopting a healthy lifestyle particularly through sporting participation. Ernest Bevin was the first secondary school in Wandsworth to receive Healthy Schools Status. The cost of a main hot meal is £2.30 a day. Baguettes, pasta pots and soup are also available at competitive prices. Click on the link below and the menu will open in a new window. 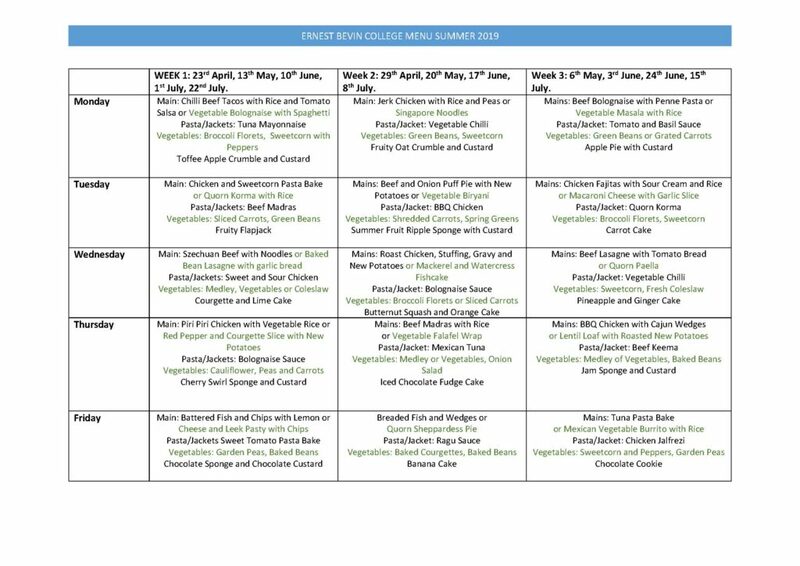 College meals are provided by Edwards & Ward caterers who prepare food on site that fulfills all current Government requirements for healthy living. A choice of hot meals (including a vegetarian option) are served daily as well as baguettes, pasta, soup and baked potatoes. All meat is Halal. There is a also a food service at break time where students can buy healthy snacks and drinks. We operate a cashless biometric system to pay for meals to make the dinner service as speedy as possible. Please note energy drinks, fizzy drinks and those with high sugar or caffeine content do not fit with the college’s commitment to Healthy Eating and should not be brought into school.